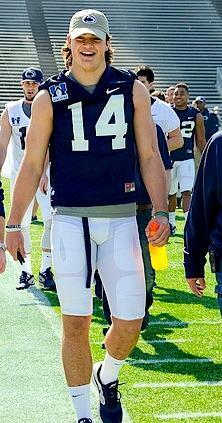 Penn State quarterback Christian Hackenberg, prior to the start of the 2014 Blue-White Game in Beaver Stadium. Photo by Mitchell Wilston, Onard State. This time of year, they arrive at Lasch Building on scooters and motorcycles and bicycles and even by foot. They’re wearing ballcaps on backwards, long blue mesh shorts to their knees and ’80s styles shorties rolled to their butts. Some are bare-chested, others have cut-off T-shirts. A few sport sleek Under Armour Techs. Several late afternoons a week they take to the football practice fields at the east end of campus. They do drills, then run suicide sprints. And more suicide sprints. Dwight Galt, Penn State’s director of performance enhancement, exhorts them on. By the end, one or two end on the ground, collapsed, exhausted. Every- one else, seemingly, clasps both hands behind their necks, gasping for air. From there, they head into Penn State’s 13,000-square foot weight room, completely overhauled two years ago. After a session of lifts, sweat and tears, many of them go back outside, led by veterans like Christian Hackenberg, Bill Belton, Mike Hull, Jordan Lucas and Adrian Amos. They throw passes, run and defend against routes, work on footwork. There is no #107kStrong to cheer them on. It’s only Galt, some strength assistants, a few managers and each other. They are Penn State’s football players, starting a summer of workouts with their third coaching staff in four years. This is where the work gets done, where games are won and games are lost. This is Of the Players, By the Players and For the Players. As Bill Shakespeare (first-team All-America, Notre Dame '36) might have said: "The player's the thing." Most Penn State scholarship players reported back to campus last Sunday, at the start of the first of two six-week academic sessions. Many are taking classes. All are working out. “At the end of the (school) year before they left we talked about what it’s going to take to be successful,” Penn State coach James Franklin said two days after the players returned for the summer. “What happens is, they say, ‘Coach, we’re working hard.’ Well, everybody in the country is working hard. In previous years, college football head coaches could only guess as to the answers, based on information passed along from upperclassmen and weight coaches. Contact in the summer between the 10 on-the-field coaches and the 100-or-so players was minimal and, by NCAA law, not to be football-specific. Summer team workouts were to be strictly “voluntary,” but that was hardly the case. On the final week of the Coaches Caravan, while Franklin was enjoying a spring homecoming in East Stroudsburg and hitting the road from Wilkes-Barre to Erie, his players were back on campus. But it wasn’t like the first-year Nittany Lion head coach didn’t know what was going on. In fact, he had already orchestrated it – not an easy task, he admits. “The problem is, everybody’s greedy,” Franklin said. “The strength coach has always gotten his hours, and he doesn’t want to give them up. Everybody else is getting more of something new, and he’s getting less. So we had a lot of conversations about how we were going to use that. What we’re going to do is kind of go with a tiered system. The mix of those eight mandated hours will shift as the start of official summer camp gets closer. And the new rules don’t mean that the players will only work out eight hours a week until then. It’s just that for eight of the 20 or 30 hours a week they’re working in the summer will be mandatory, even more structured and in direct contact with a coach. “What we’re going to do is a tiered system,” Franklin said. “At the beginning of the summer, it’s going to be mainly strength and conditioning. As the summer goes on and it gets closer to the season, we’ll go a half-hour of film, an hour of film, an hour-and-a-half of film to two hours of film. So it’ll grow as the year goes on. Still, as has always been the case, a lot of the burden falls on the shoulders of the veteran players. And even though Hackenberg has been on campus less than a full year – he officially arrived at PSU on June 12, 2013 – he is a key component of that team leadership. That’s on the field and off it. Penn State offensive coordinator John Donovan, whose offenses at Vanderbilt were led by a succession of fourth- and fifth-year seniors, has been impressed by Hackenberg, whether the soon-to-be sophomore quarterback is calling a play at the line of the scrimmage or urging on someone during sprints. Ricky Rahne, the Nittany Lion quarterback coach and a three-year starter at the position at Cornell, has come up with a way to coach his players – even when he’s not there. Rahne begins with a video “cut-up” of action from a practice, a scrimmage or a game (very often a Vanderbilt game, since the PSU offense is built in its image), and then provides an audio narrative. “We create tapes that players can come in and watch in their leisure, and I don’t have to be there,” Rahne said while he was in Wilkes-Barre, in the midst of a recruiting road swing when Hackenberg and his other quarterbacks were back in State College. “It can be a play from practice or the coverage of an opponent. It can be multiple plays from a single game tape. Rahne, who will turn 34 next month, is both high tech and high touch. He’s known for hand-writing notes to almost everyone he meets on the recruiting trail. But he also knows an iPad can also be a wePad -- connecting a player with a physically absent coach. 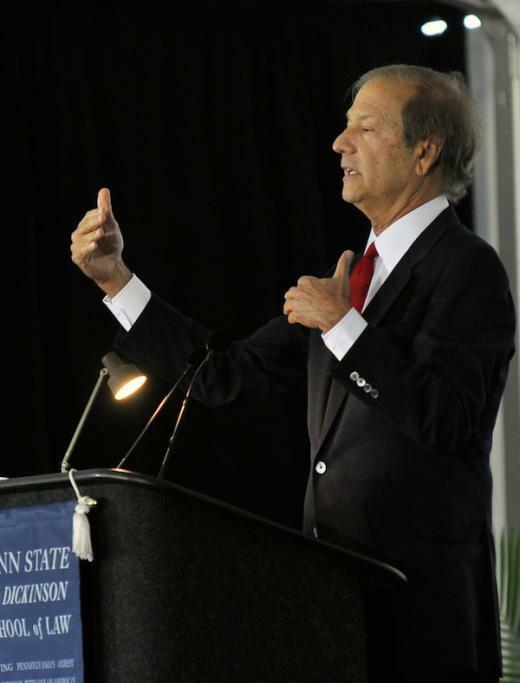 Lewis Katz, who donated $15 million to Penn State for the construction of the law building has died in a tragic plane crash in Massachusetts.